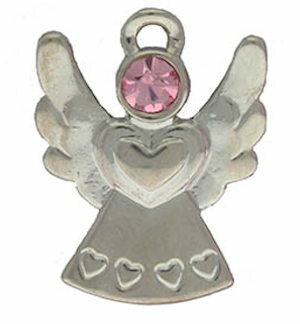 Beautiful Mom Angel Lapel Pin with Pink Crystal and Silver Hearts. Lapel Pin measures 1 inch tall with clutch back. Perfect for that special Mother's Day, birthdays or just because she's loved. 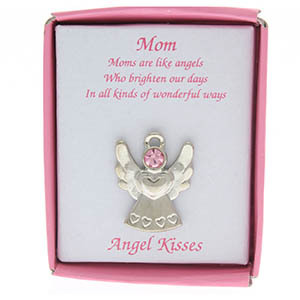 Mom Angel Lapel Pin comes boxed with an inscription. The inscription reads: Mom: Moms are like angels who brighten our days in all kinds of wonderful ways. I purchased this pin for my mom and it is as cute as a button. My mom's friends saw it on her sweater and asked where they can get them. Everyone in the retirement home loved them so I bought more to pass out to the other moms. Thanks you for this item.